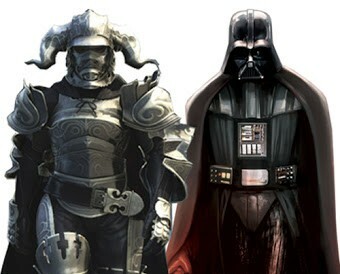 Final Fantasy XII: Did it rip off Star Wars and get away with it? What’s the difference between an homage and a ripoff? Why do some stories provoke cries of plagiarism while others inspire glee from fans that a thing they love is being acknowledged? This week, I’m going to talk about a story that pulled off a successful homage, and how they managed to do it. The story they, let’s say, “drew inspiration from” is Star Wars. I don’t need to explain what that is. You all know. The result was Final Fantasy XII, an installment of Square Enix’s Final Fantasy series of roleplaying games (RPGs, to us gamers). When it comes to RPGs, or even video games in general, Final Fantasy is one of the greats. While Final Fantasy XII is not as well-known as others in the series, having a bit of a black sheep reputation, it was still pretty big. How did it manage to rip off Star Wars, of all things — and get away with it, no less? Let’s start with the game’s basic scenario. See if you can spot the … similarities. A poor boy from the desert has dreams of becoming an airship pilot, but life has been hard since the neighboring empire took over the kingdom. After accidentally getting his hands on a thing the empire wants, the boy ends up in the company of a handsome, smooth-talking “sky pirate” and his part-animal sidekick. They soon join forces with the princess of the kingdom, who is the leader of a rebel alliance, and set out to stop the evil empire. Since it’s a JRPG, the furry alien is now a bunny girl. The villain of the story is a corrupt prince who draws his strength from a mysterious and otherworldly power. He puts up a farce of senates and elections but ends up murdering his way into the emperor’s throne. His second-in-command used to be a good guy, is related to one of the main characters and wears full armor and a helmet that covers his face. Wow. With nothing but that to go on, you’d wonder why on earth George Lucas didn’t sue Square Enix for everything they had. And it’s not like people haven’t noticed — they have. Multiple times. (Sounds like the audio and video were made to go together, weren’t they?) Square Enix has never officially mentioned the resemblance, but they are self-confessed Star Wars fans, having added little references and the like to their Final Fantasy games since Final Fantasy II. It’s safe to say that they knew what they were doing. None of this bothers me, because Final Fantasy XII is still its own game. Let me explain. I got the game the week after it came out. Sank about 80 hours into it (it’s a pretty long game!). The whole time I played it, thought about, it recommended it, whatever, what came to my mind was not, “Oh, it’s like Star Wars, except it’s a video game.” In fact, what Final Fantasy XII resembles most is another Final Fantasy game — namely, Final Fantasy Tactics, which is set in the same world, was worked on by the same team, and has the same dense language, strong worldbuilding, and complex political plot. I love Star Wars, but … sorry, it most definitely does not have any of those things. That summary I told you up there? That’s the bare-bones scenario. Just look at the plot and characters for more than a minute, and the differences become obvious. I knew it was inspired by Star Wars by looking at the box. Come on, is somebody going to point out that the game’s poster is almost the same as every Star Wars movie? Final Fantasy XII is a great game, very underrated, if X got a HD remake, the XII should as well. I thought this the day I first played it with Vaan being luke Ashe as Lea Balthier being Han and Fran being Chewy. The only thing is FF12 isn’t overrated and bland. The new movies were better. Except Return of the Jedi that one was awesome!. Not trying to be rude, but don’t you ever compare Final Fantasy which is the greatest game franchise on the planet earth with Star Wars which is a rather overrated movie franchise. Overrated or not, it’s still one of the most well-known movie franchises of all time, and its influence on popular culture lasts to this day. So when there are such obvious, blatant similarities in FFXII, it’s not like I can just overlook them. If u want to look at overrated look a twilight or harry potter. Star Wars has been a major influence for the science fiction and fantasy genre since its inception regardless of what u and the other haters have to say about it.